Eberron is a place of discovery, and what better area to explore than that of magic? 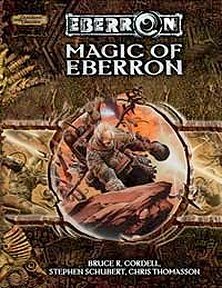 Publisher's blurb: "Magic of Eberron explores the variety of magic available in the Eberron world. It introduces a wealth of new arcane and divine spells, and artificer infusions. Chapters explore the more unusual manifestations of magic in Eberron, such as elemental binding, dragonshards and dragon magic, and the corrupted magic of the daelkyr. A chapter on lost magic explains how to make the discovery of new magical secrets a central feature of any Eberron campaign."